In this post we focus on artists who have a connection with Sussex and the south coast - either by way of living here, or simply that this beautiful region inspired their work. 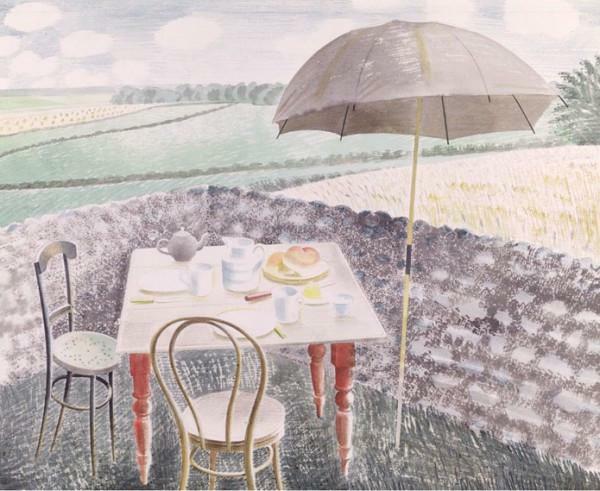 Eric William Ravilious - an English painter, book illustrator, designer and wood-engraver - grew up in East Sussex and was particularly famed for his watercolour paintings of the South Downs and landscapes across the british isles. He was a student of Pete Nash (mentioned further down this post), studying at Eastbourne School of Art and The Royal College of Art. Now at the Fry Art Gallery (accession no. 856). 350 x 430 mm; print reproduction. Furlongs was a cottage on the South Downs, near Glynde and Lewes, which was occupied by Ravilious' friend Peggy Angus. 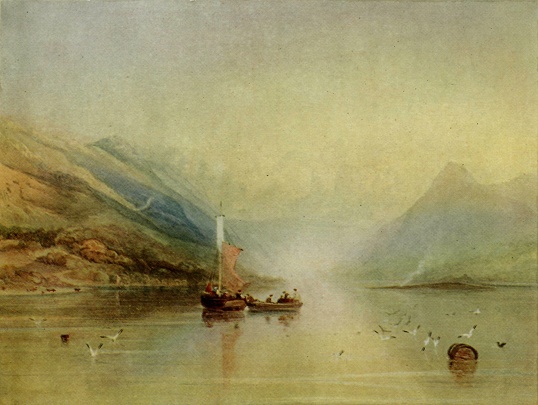 JMW Turner, full name Joseph Mallord William Turner, was an English Romantic painter, known for his watercolours and often stormy paintings depicting marine landscapes. 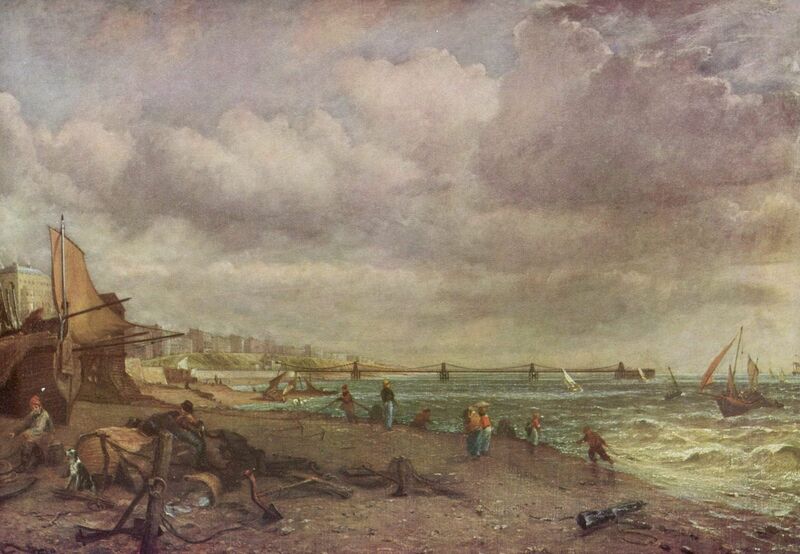 Turner studied at the Royal Academy of Arts, enrolling at age 14 and seen as something of a child genius. 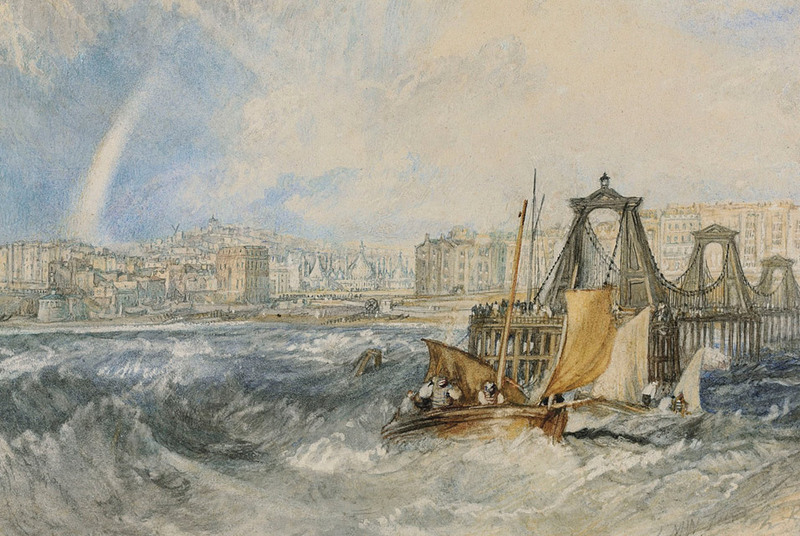 Turner’s work of Brighton’s Chain Pier, with Brighton Pavillion in the background is currently on show at Brighton Museum & Art Gallery. The Gallery secured the painting after it came up for auction in New York in 2012, having been the possession of private collectors since it was bought in the 1830s. Joseph Mallord William Turner, R.A., Brighthelmston, Sussex, c1824 Pencil, pen and black ink and watercolour with scratching out on Whatman paper. William Blake - mostly unrecognised during his own lifetime, as can often be the case in creative pursuits, is now widely considered a key figure in visual artworks of the Romantic era. He lived in Felpham, Sussex, between 1800-1803 - spending the rest of his life in London. Blake’s work included pieces that he called his prophetic works. His mastery of his art resulted in critic Jonathan Jones labelling Blake as “far and away the greatest artist Britain has ever produced. William Blake. The Body of Abel Found by Adam and Eve, c. 1825. Watercolour on wood. 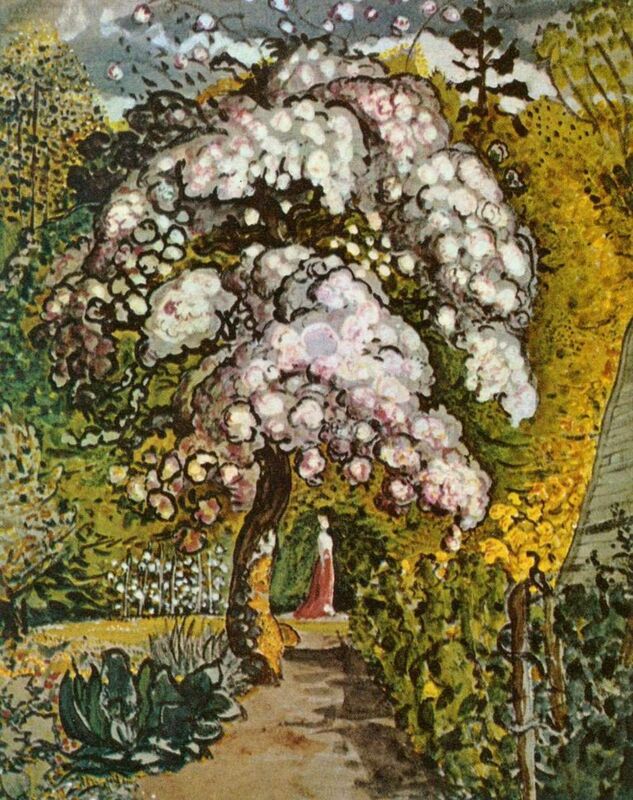 Samuel Palmer, a British, painter, printmaker and etcher, was a much highly respected figure in the Romanticism era. He painted churches from the age of twelve and exhibited JMW Turner-esque artworks at the age of just fourteen, in the Royal Academy. 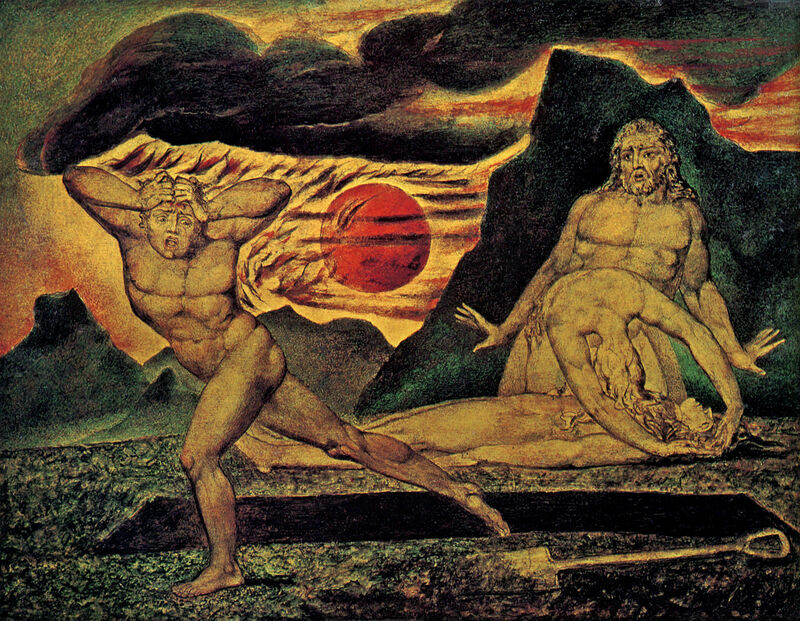 He met William Blake in 1824 and Blake's influence is noticeable in the work Palmer did over the following decade - on the whole considered to be his best. These pieces were predominantly landscapes around Shoreham, in Kent. George Smith was born in Chichester, Sussex. He and his two brothers were all painters and known as ‘the Smiths of Chichester’. 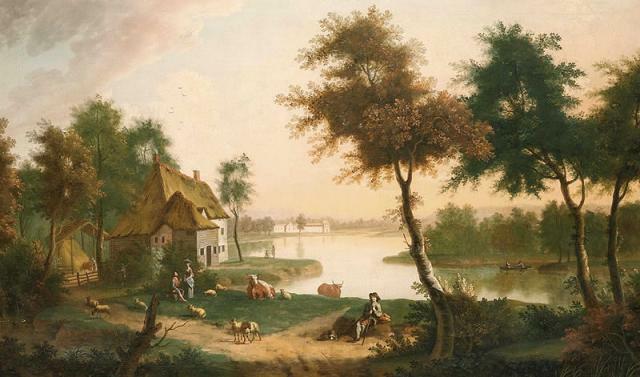 Smith’s art portrayed pastoral and rural scenes of Sussex and other areas of England. His reputation as a highly regarded artist stretched across Europe, where he was commonly known as the “British Gessner”. John Constable was an English landscape painter in the naturalistic tradition. He married childhood friend, Maria Elizabeth Bicknell, in 1816. They took in a honeymoon tour of the south coast. The sea at Weymouth and Brighton stimulated Constable to develop new techniques of brilliant colour and energetic brushwork. At the same time, a greater emotional range began to be expressed in his art. John Constable. The Chain Pier Brighton, 1824-1827. Oil on canvas. 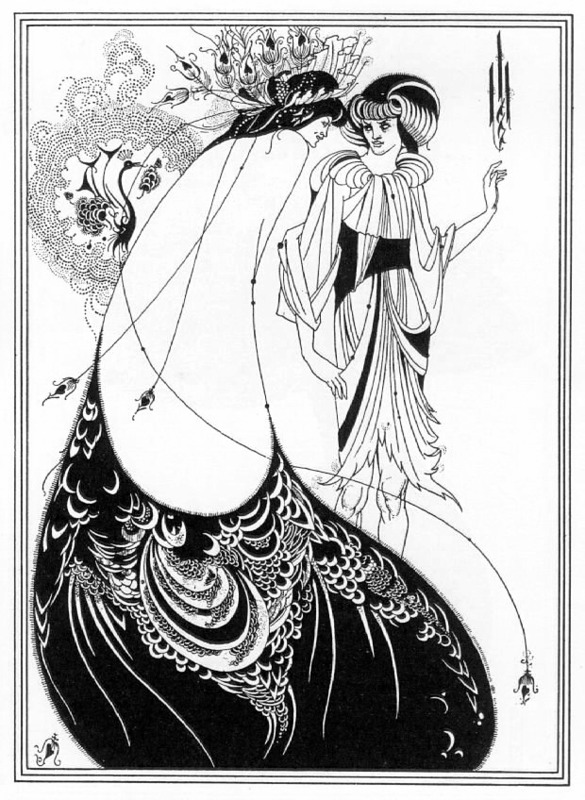 Aubrey Vincent Beardsley was born in Brighton, England, on 21 August 1872. He was a leading figure in the Aesthetic movement, which also include Oscar Wilde. Beardsley’s contribution to the development of the Art Nouveau and poster styles was significant. Sadly he died at the age of just 25, from Tuberculosis. Aubrey Vincent Beardsley. Peacock Skirt. 1893. Anthony Vandyke Copley Fielding, commonly called Copley Fielding, was an English painter famous for his watercolour landscapes. At an early age Fielding became a pupil of John Varley. He also engaged largely in teaching the art and made ample profits. He later moved to Park Crescent in Worthing and died in the town in March 1855. Edward John Burra was an English painter, draughtsman and printmaker, best known for his depictions of the urban underworld, black culture and the Harlem scene of the 1930s. Burra travelled widely and many of his artworks are influenced by what he saw and the different cultures he experienced on his travels. 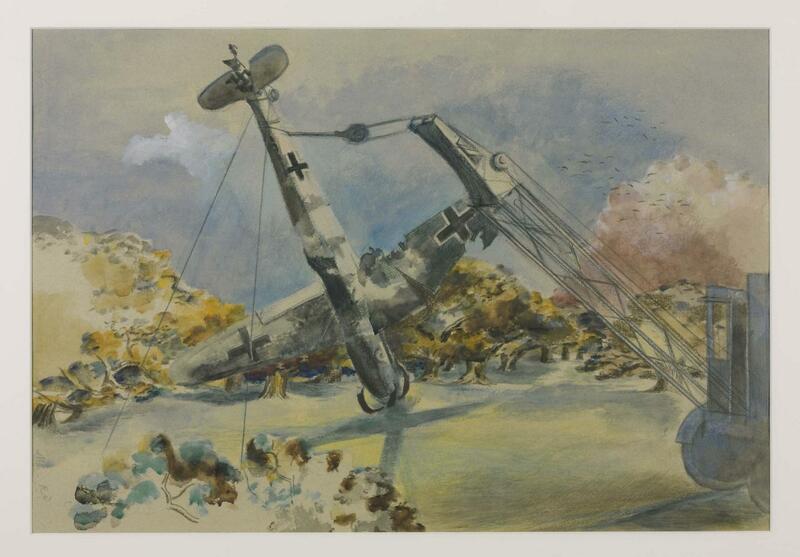 His works were usually watercolour on a large scale, using bold colours. In 1974, following a hip break, his health declined sharply and he died in Hastings, Sussex in 1976. Edward Burra. Skull in a Landscape. 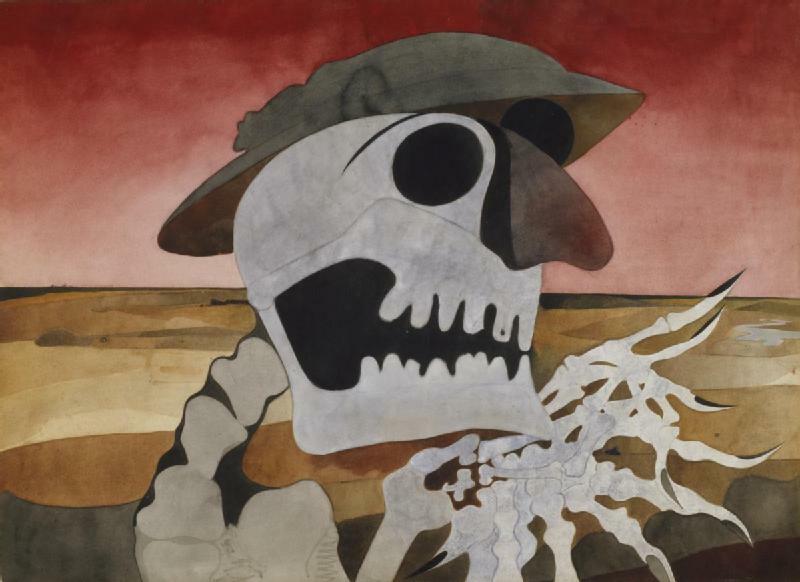 British surrealist painter and war artist, Paul Nash was one of the most important landscape artists of the twentieth century, playing a key role in Modernism’s development in English art. One highlight included a financially successful exhibition that he held at the Leicester Galleries in 1924. Subsequently, this success enabled the Nashes to enjoy winter in the warmer climbs of Nice, visiting Pisa and Florence during that time. After 1925, they moved to the village of Iden near Rye in Sussex. Paul Nash. The Messerschmidt in Windsor Great Park. 1940.